If you’ve ever shopped Stems Market, you know we enjoy breaking all the rules of the floral industry. You know we sell fresh cut flowers at such great prices you can afford to have them in your house everyday not just on the special days. You also may have seen our wedding flower program that is anything but normal and our brides love it. If you really know us, you even know we love coffee. We love coffee so much that we created our own Stems Blend coffee and have it roasted fresh weekly by the Roastmaster at Grand Rapids Coffee Roasters because any other coffee is just so… normal. Everyone knows, We Don’t Deliver, thats for the normal follow-the-rules-companies. With that said, there is one rule we always follow and it has always served us well. -Always provide the products and services in the method the customer desires them. Well, its time to break the rules and respond to our customers desires. You spoke, we listened and it’s time to break the rules again, don’t worry, we enjoy this sort of thing. Introducing Stems Delivered! 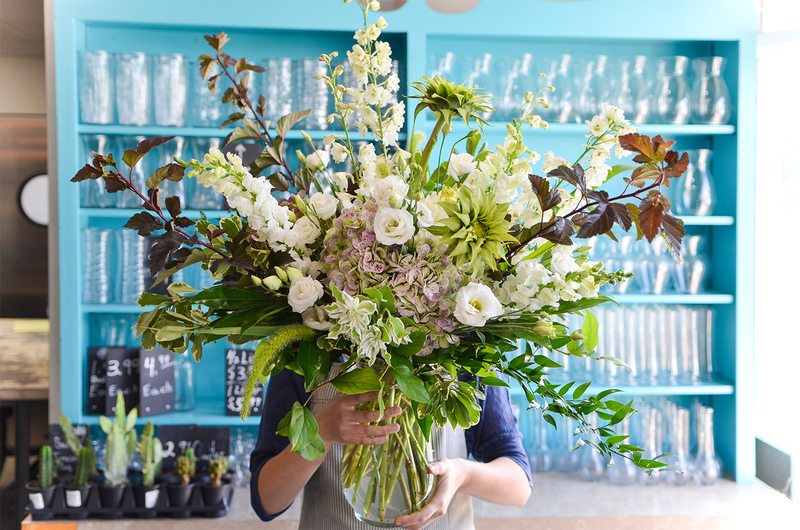 A flower delivery service that is anything but a run-of-the-mill 1950’s designs. Instead, our own Stems Blend style offers products like fresh cut bouquets, fresh bunches, and fresh cut bouquets in a vase at fantastic prices and quality. Based on the seasonal availability, we will create a new design recipe or two of the week using the freshest focal flowers, fillers and greens and and then offer them with a vase or without so you can enjoy the fun of arranging them in your own container. Our flowers are fresh and thats only what we’ll deliver…Seriously, and we’ll stand behind it. We wont go buy a new boat with the revenues collected from our delivery fees. As a matter of fact, all prices are delivered and include a modest charge to ensure we have enough gas to get to and from your delivery location. How does Stems Delivered work? It’s super simple and kinda like ordering a pizza, You Order, We Deliver. Log on to our website click on the “Stems Delivered” link and browse the designs of the week. Choose the design of your liking and add it to your cart. That’s it, give us delivery information and card message if desired then check out securely.